This combination elevates the book, but it also means it is a book best read slowly. Readers are likely to find themselves pausing to contemplate the message behind each essay. Freese is direct and opinionated, and he often takes an opinion counter to popular thinking. Take, for example, the essay "Teachers Have No Chance to Give Their Best," where he begins by railing against students for their "puerile minds" and "vacuity." But while these words are harsh, he lays the blame squarely on teachers. As a former teacher himself, he strongly suggests that schools need to do more to encourage creativity and self-reliance. Just when it seems he has given up, labeling the educational system as "a great Arctic mammoth wandering aimlessly," he offers up a glimmer of hope: "Take any five decent, well-intended, creative and committed teachers and administrators, people who care, people in passion, free men and women, and one could wreak a reformation in weeks." The personal essays in the back of the book provide a look at his family's trials and grief. From the tragic loss of both his first wife and his daughter, to coping with memories of a neglected childhood, he writes powerfully when he is at his most personal. In many ways, these essays might have been a better way to begin this collection, since it would have helped to provide a real sense of the writer, in a personal way, before the denser, academic pieces. This is a book that will stay with the reader, that will occasionally pop up as an undercurrent to conversations. While it doesn't quite reach the heights of his fiction masterpiece, The i Tetralogy, it is a thoughtful, compelling read. 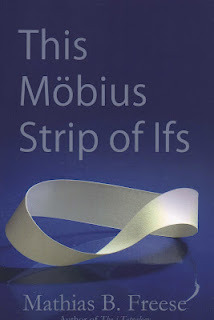 Sign into Goodreads to see if any of your friends have read This Mobius Strip of Ifs.